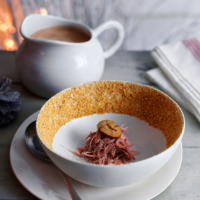 Fragrant shredded duck surrounded by velvety soup suffused with the earthy, autumnal flavours of mushroom and chestnut – the perfect winter warmer. 1. Preheat the oven to 180 ̊C, gas mark 4. Put the juniper berries, star anise, fennel and coriander seeds on a tray and roast for 5 minutes. Cool completely, then blitz in a spice grinder or food processor to a powder. Mix with the lemon and orange zest and salt. Rub this mixture onto the duck legs and place in a covered container in the fridge for 24 hours. 2. Preheat the oven to 70 ̊C. Rinse the legs thoroughly; pat dry with kitchen paper and place in a casserole dish into which they fit tightly. To confit the legs, melt the goose fat in a saucepan so it is liquid but not hot, then pour over the legs, making sure they are completely submerged in the fat. Add the thyme and bashed garlic, cover the dish and place in the oven for 18 hours. for a later use. Shred the meat from the duck legs using 2 forks. Cover and chill until ready to use. and leek, then sweat until soft. Add the mushrooms and cook until soft, about 15 minutes. Deglaze the pan with the white port and madeira, simmering until it has reduced to a syrupy consistency. 5. Add the chicken stock and thyme, then bring to a simmer. Add the chestnuts, simmering for a further 20 minutes. Add the cream and milk, then simmer for an additional 15 minutes. Blitz the soup with a hand blender or in a blender until smooth, then pass through a fine sieve. Return to the pan, add the sherry vinegar and season. 6. To serve, preheat the oven to 180 ̊C, gas mark 4. Put the hazelnuts on a roasting tray and cook for about 10 minutes until golden brown. Cool, then blitz in the small bowl of a food processor to a coarse powder. 7. Brush the inside rim (about 2cm deep) of 6-8 soup bowls with the remaining brown butter and coat with the hazelnut powder. In a bowl, mix the shredded duck meat with the orange zest, then place about 1 tbsp duck meat mixture in the centre of each bowl. Place a couple of slices of chestnut on top. 8. Heat the soup in a pan over a medium heat. Once hot, using a hand blender, aerate the soup for 1 minute to make it light and frothy. Pour the frothy soup into the bowls on top of the shredded duck at the table.